"There’s something mystical about Kitzbühel." Franz Klammer, in 2004 Stephan Eberharter had a dream run on the Streif. What were your experiences of watching the race back then? Franz Klammer: I was in the finishing area, astounded like everyone else. It was a fantastic run. And vice versa? How did you, Stephan, experience the Klammer victories? Stephan Eberharter: I was very young at the time, but I remember the Olympic triumph like it was yesterday. I used our first home-stereo system to record a cassette of the radio transmission and listened to it again and again for years on end. I still know Franz‘ winning time today. On another note: did you see Otmar Striedinger’s crash during today’s training? His binding just came flying off. Klammer: Luckily it wasn’t so bad in the end. If you ask me, the Steilhang exit isn’t just Kitzbühel’s most challenging curve, but the hardest one in the whole World Cup. I had the same binding issue before the Mausefalle once: one little bump and snap, my ski was gone. 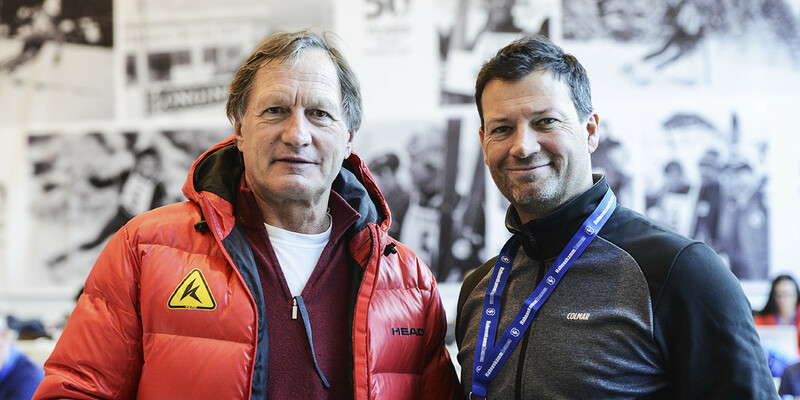 Eberharter: It’s alright as long as you don’t pull a Franz Heinzinger: he had barely started his run at the Olympic Downhill and his binding came clean off (laughs). What thoughts come to mind when you drive into Kitzbühel nowadays, what characterizes this place for you? Eberharter: There’s something mythical about it. The combination of tradition, spectators and the race course is incomparable. Klammer: The exciting thing is that for any normal skier, the Streif would be un-skiable, which isn’t the case in Wengen or Gröden. That’s why “normal“ people feel the need to watch racers who dare to take on this slope. Eberharter: That’s exactly right. The only thing I ever hear is how we must be out of our minds and that we probably just turn our brains off. I always say: We didn’t learn to race from one day to the next - we’ve been doing this since we were kids. Apart from that, we’d never switch our brains off on the Streif. Klammer: Whoever switches his brain off is making a huge mistake. It’s just as important as your thighs. Stephan, let’s talk a bit more about 2004: Did you know back then that you had that dream run in you? Eberharter: The last three years of my career were the best. In 2004 I knew that it would be my last race, so I was more eager to win than ever. During one of our training runs two days before the race, I saw how Daron Rahlves – my greatest opponent at the time – followed a very tight race line on the Hausbergkannte. None of the other athletes were doing that. So, I tried it out myself and that’s what earned me those few tenths of a second I needed to win Klammer: Stephan observed that very well at the time. You can get a lot out of that bottom section. Let’s talk about the lesser-known course sections. The gliding segment after the Steilhang gives you the chance to take a breather, I am right? Eberharter: That is what all of you watching television like to believe (laughs). If the truth be known, you do everything in your power to glide as well as possible and if I am honest: no part of the Streif goes faster than the “Ziehweg” up there. Klammer: Before you know it, you are in the Alten Schneise - another underestimated section. The whole slope has a strange right-hand incline and you should really ski as straight as possible, rather than slipping. Eberharter: We often skied that differently to how you did back then, Franz. During my time, we actively jumped to the left and let the slope to pull us down to the left, allowing us to maintain speed and save energy. So, you can lose time in the most innocuous sections? Klammer: In my day, the entrance to the Lärchenschuss was almost more important. There is undulating terrain and when you lose speed there, it affects the Hausbergkante section. Eberharter: I would say that you can win or lose as much as a whole second from the Alten Schneise to the Hausbergkante. Was the course more challenging back then than today? Klammer: It is difficult to compare. We had natural snow in my time, which meant the course was more uneven and you encountered both powder snow and sheer ice. Nowadays it is more even and a hundred times smoother. The speeds at which beds are taken is respectively higher. I would say: Toni Sailer skied to the limit in his time, as I did in mine, Stephan in his and the boys today give their very all. The time spent between races is professionally organised by the skiers of today – was the Hahnenkamm Weekend more relaxed in your day? Klammer: You could say that. We also stayed on the outskirts of town, away from the hustle and bustle, but we didn’t have to pay attention to our diets. We completed two training runs and then went to Cafe Praxmair, where we ate apple strudel, watched videos and then we competed in the race the next day. Does that mean that you were able to enjoy it more? Klammer: The athletes have loads more peripheral activities today. They have to go to press conferences, the prize-giving ceremony – there isn’t much time left over to relax. You can enjoy the whole thing at my age (laughs). Eberharter: That is exactly what happened after my win in 2004. Everyone thought we were celebrating all night long, when in fact it was one long round of press conferences, the prize-giving ceremony, ORF studio visit, doping checks and a visit to the VIP marquee, before I fell into bed exhausted at around 11.30 p.m.